Recipients are chosen by a jury of green school leaders and advocates from around the country, and selected based on their demonstration of real change in our schools. MRHMS believes that sustainable schools provide all community members with the greatest opportunities for success. It has integrated sustainability and green practices into its curriculum, including lessons in gardening, aquaponics, urban chickens, beehives, composting and rain gardens. 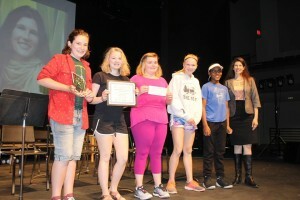 Maplewood Richmond Heights was also recognized as 2nd Place Winner in the 2017-18 Green Schools Quest Middle School Category! 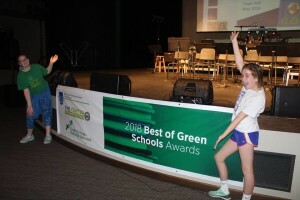 This is the third time that MRH middle school has been acknowledged as a winner during the five years of the Green Schools Quest – clearly demonstrating leadership and creativity in response to the challenge to imagine and implement a new sustainability project for their school. Learn more on Maplewood Richmond Heights School District Website. The 25×20 Voluntary Energy Benchmarking Campaign challenges buildings in the St. Louis Region to benchmark their energy use. Energy benchmarking is the key to unlocking potential energy and cost savings. 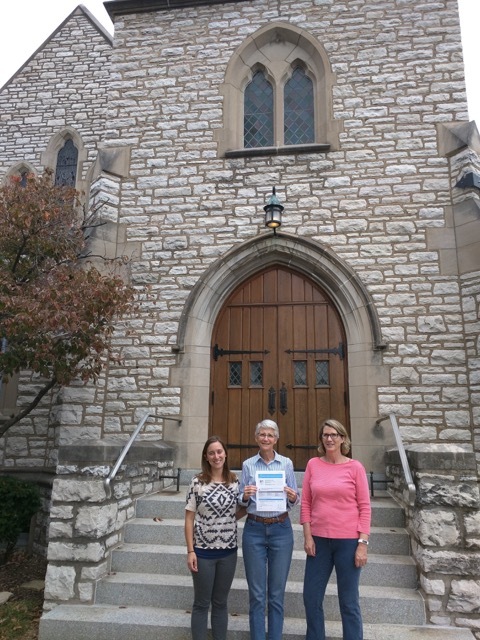 Since the campaign was launched, businesses, local governments, houses of worship, schools, and institutions have pledged to benchmark their energy use! 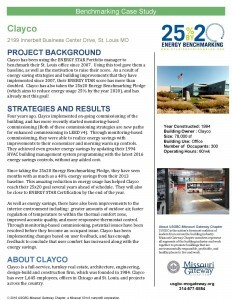 25×20 participants include Clayco, now featured in a benchmarking case study. 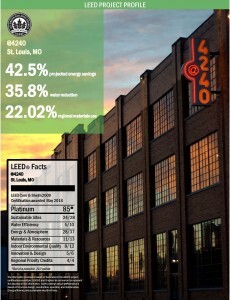 Clayco has been using ENERGY STAR Portfolio Manager to benchmark their St. Louis office since 2007. Using this tool gave them a baseline, as well as the motivation to raise their score. As a result of energy saving strategies and building improvements that they have implemented since 2007, their ENERGY STAR score has more than doubled. 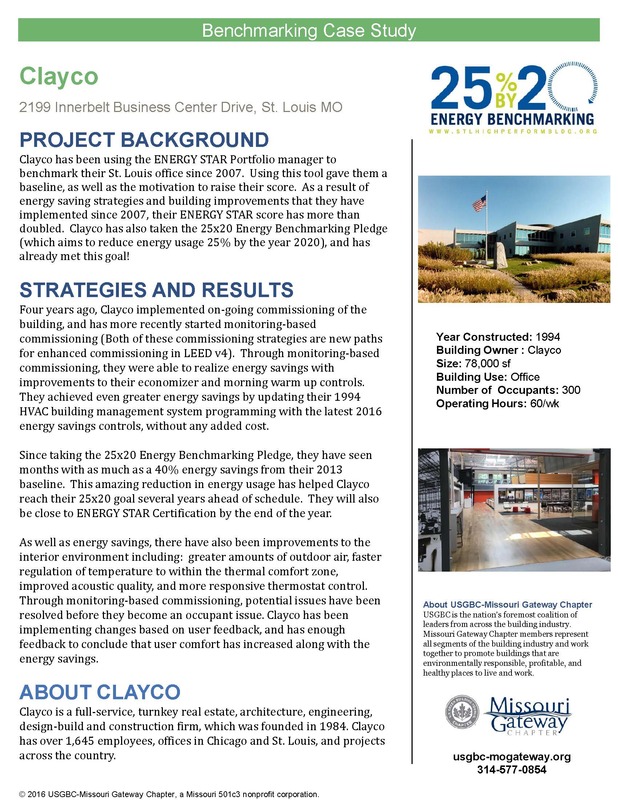 Clayco has already met their goal to reduce their energy use 25% by the year 2020! Four years ago, Clayco implemented on-going commissioning of the building, and has more recently started monitoring-based commissioning (Both of these commissioning strategies are new paths for enhanced commissioning in LEED v4). Through monitoring-based commissioning, they were able to realize energy savings with improvements to their economizer and morning warm up controls. They achieved even greater energy savings by updating their 1994 HVAC building management system programming with the latest 2016 energy savings controls, without any added cost. Since taking the 25×20 Energy Benchmarking Pledge, they have seen months with as much as a 40% energy savings from their 2013 baseline. This amazing reduction in energy usage has helped Clayco reach their 25×20 goal several years ahead of schedule. They will also be close to ENERGY STAR Certification by the end of the year. As well as energy savings, there have also been improvements to the interior environment including: greater amounts of outdoor air, faster regulation of temperature to within the thermal comfort zone, improved acoustic quality, and more responsive thermostat control. Through monitoring-based commissioning, potential issues have been resolved before they become an occupant issue. Clayco has been implementing changes based on user feedback, and has enough feedback to conclude that user comfort has increased along with the energy savings. Clayco is a full-service, turnkey real estate, architecture, engineering, design-build and construction firm, which was founded in 1984. Clayco has over 1,645 employees, offices in Chicago and St. Louis, and projects across the country. You can view the full case study online here. Visit the 25×20 page of our website to see a full list of participants, browse other benchmarking case studies or take the 25×20 pledge! Contact Chapter staff at usgbc-mogateway@mobot.org to be featured in a benchmarking case study. 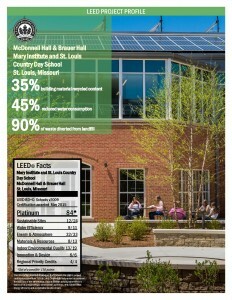 Mary Institute and St. Louis Country Day School’s LEED Platinum McDonnell Hall & Brauer Hall is the latest LEED project to be featured in a USGBC-Missouri Gateway Chapter LEED Project Profile. The project earned 84 points and received Platinum certification in LEED for Schools v2009 in May of 2015. The new Science, Technology, Engineering, and Math (STEM) educational facility serves as a teaching tool and is filled with design elements featuring concepts taught in the curriculum. The design of the new facility was created for improved energy and water efficiency, and includes a rainwater harvesting system, a solar thermal system, a rooftop photovoltaic array, a high-efficiency HVAC system, and more! And over 90% of the building demolition and construction debris was donated or recycled. Learn more about the building’s sustainable strategies, the project team, and MICDS in the project profile. Visit our Local LEED Projects page to learn more about LEED buildings in our Chapter territory, or browse all of the project profiles below. McDonnell Hall & Brauer Hall hosted the 2014 Green Schools Event. Be sure to join us on April 12 to celebrate green schools at the 2016 Green Schools Event! The 25×20 Voluntary Energy Benchmarking Campaign challenges buildings in the St. Louis Region to benchmark their energy use. Energy benchmarking is the key to unlocking potential energy and cost savings. 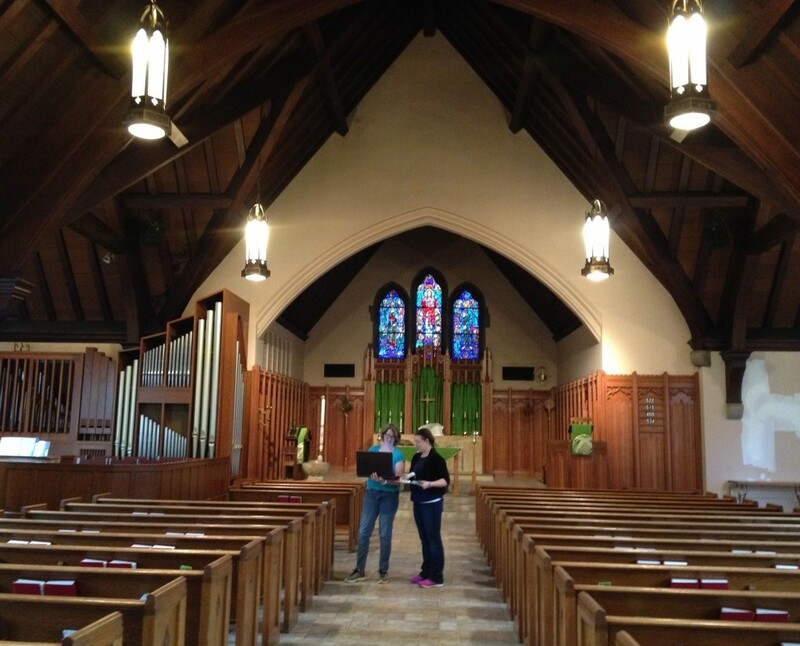 Since the campaign was launched, businesses, local governments, houses of worship, schools, and institutions have pledged to benchmark their energy use! 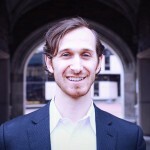 25×20 participants include UniGroup, now featured in a benchmarking case study. UniGroup is a $1.7 billion transportation and relocation services company with headquarters in suburban St. Louis. In addition to household goods carriers United Van Lines and Mayflower Transit, logistics company UniGroup Logistics and international relocation providers UniGroup Relocation and Sterling, UniGroup owns other subsidiaries that provide goods and services to professional movers. The headquarters for UniGroup has grown dramatically since the original building was built in 1968. The facility has been expanded over the years, resulting in more than 450,000 ft2of office space. There is also an on-site cafeteria (a 5-star member of the St. Louis Green Dining Alliance), an employee fitness center and a credit union. 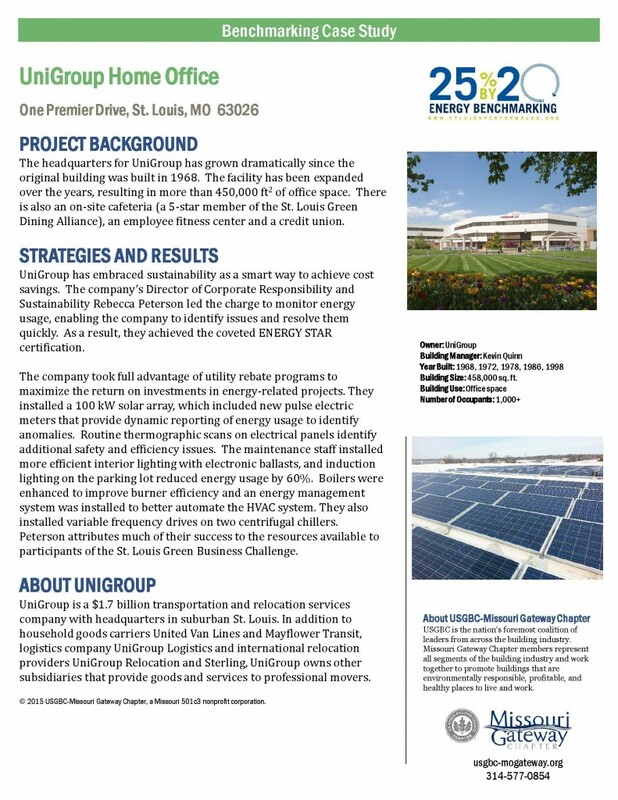 UniGroup has embraced sustainability as a smart way to achieve cost savings. The company’s Director of Corporate Responsibility and Sustainability Rebecca Peterson led the charge to monitor energy usage, enabling the company to identify issues and resolve them quickly. 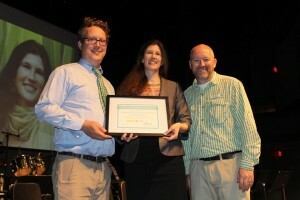 As a result, they achieved the coveted ENERGY STAR certification. The company took full advantage of utility rebate programs to maximize the return on investments in energy-related projects. They installed a 100 kW solar array, which included new pulse electric meters that provide dynamic reporting of energy usage to identify anomalies. Routine thermographic scans on electrical panels identify additional safety and efficiency issues. The maintenance staff installed more efficient interior lighting with electronic ballasts, and induction lighting on the parking lot reduced energy usage by 60%. Boilers were enhanced to improve burner efficiency and an energy management system was installed to better automate the HVAC system. They also installed variable frequency drives on two centrifugal chillers. Peterson attributes much of their success to the resources available to participants of the St. Louis Green Business Challenge. You can view the full case study online here. Visit the 25×20 website to see a list of all participants or take the pledge. Contact Chapter staff at usgbc-mogateway@mobot.org to be featured in a benchmarking case study! 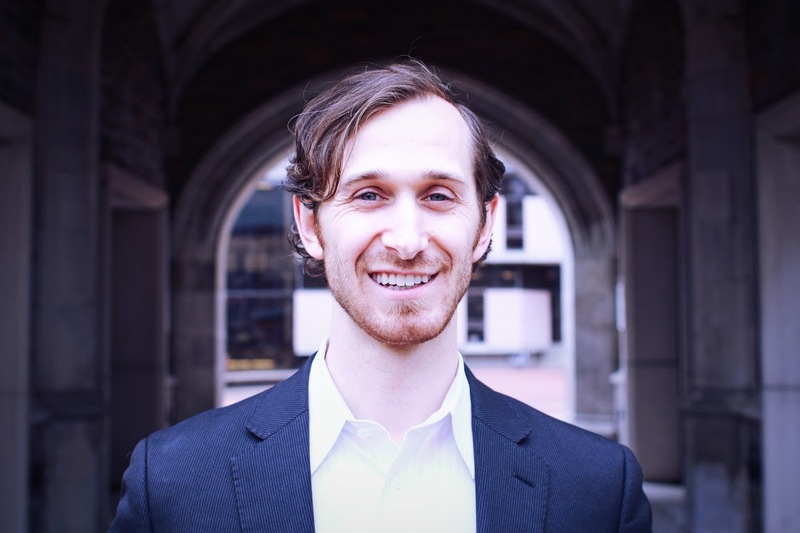 25×20 participants include 600 Washington, now featured in a benchmarking case study. This 25-story office building, formerly known as One City Center, is a 375,000 square foot office building with a variety of tenants, including several large legal and accounting firms. 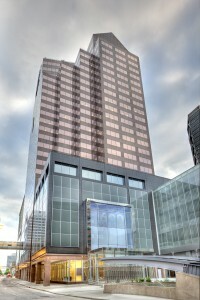 Originally built in 1985, the tower overlooks the former St. Louis Centre mall which has since been transformed into a 750 space parking garage in 2010. 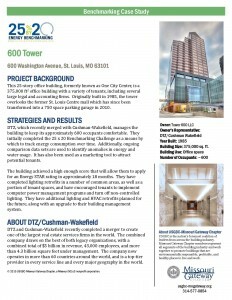 DTZ, which recently merged with Cushman-Wakefield, manages the building to keep its approximately 600 occupants comfortable. They initially completed the 25 x 20 Benchmarking Challenge as a means by which to track energy consumption over time. Additionally, ongoing comparison data sets are used to identify anomalies in energy and water usage. It has also been used as a marketing tool to attract potential tenants. The building achieved a high enough score that will allow them to apply for an Energy STAR rating in approximately 18 months. They have completed lighting retrofits in a number of common areas, as well as a portion of tenant spaces, and have encouraged tenants to implement computer power management programs and turn off non-controlled lighting. They have additional lighting and HVAC retrofits planned for the future, along with an upgrade to their building management system. Click here to view a PDF of the case study. Visit the 25×20 website to explore the full list of participants! 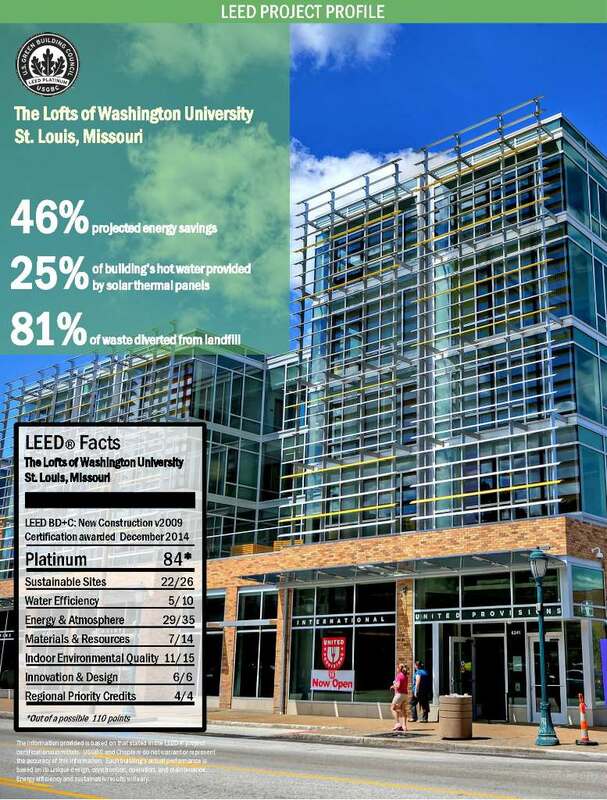 Southern Illinois University’s Art & Design Building Expansion is the latest LEED project to be featured in a USGBC-Missouri Gateway Chapter LEED Project Profile. The project earned 63 total points, earning Gold in LEED for New Construction and exceeding the University’s goal of earning LEED Silver. 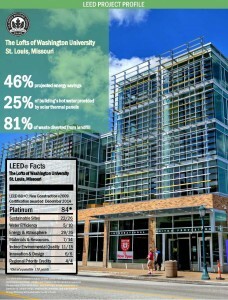 Learn more about the building’s sustainable strategies, the project team, and SIUE in the profile here, or visit our Local LEED Projects page explore more LEED profiles!